TemplerFx is an online Foreign Exchange Trading Services provider. The brokerage company is operated by Templer Holdings Management Limited. MetaTrader 4 trading platform enables trading more than 20 currency pairs and various commodities. TemplerFx is open for private and institutional investors. The company implements three major stages of success: high quality customs service, cutting-edge technologies, and high professionalism. Templer FX has a wide range of leading liquidity providers, thus, the company arranges competitive currency spreads. TemplerFx claimed to be the leading brokerage company in terms of online currency trading. Clients may trade without the dealer’s participation. The automatic risk management system (RMS) unifies execution venues across the world and aggregates liquidity pools. Risk management system's unique artificial intelligence engine delivers straight through processing to interbank markets with greater speed than any human dealing desks can ever provide. Company’s software, which facilitates profitable binary options trading, is recognized as groundbreaking. Instant execution of deals according to NDD model is guaranteed by the company. The systems of transaction monitoring and risk management are among the automated processes provided by Templer FX. It ensures that a client's balance will never fall below the level of their initial deposits, i.e. the company guarantees a zero account balance if a client falls into negative equity. Thus, a client cannot lose more than the initial deposit. Professional support is offered in English, Chinese, Spanish, and Russian. If you look for a forex provider, you may focus on TemplerFx. If you have cooperated with the company, please leave your comments. It might be useful. I've been seeing TemplerFX almost everywhere whenever i browse the internet. So I got curious and checked it out. They have a very low minimum deposit of only $25 so I thought why not give it a try. I deposited $30 and tried trading. As I already expected, I would make a lot of mistakes since I didn't really have any background in Forex trading. But one of their staff contacted me and offered a month of training to guide me in my trades. I agreed and I was assigned a mentor. It was very effective because I am now more capable of trading wisely and I have already lessen my losses. This broker really cares about their traders, that's for sure. I am a client of TemplerFx broker for this past 2 years and I really like their services. Beside the good trading platform and system, their customer support also was very fast and efficient. The support have a nice explanation and knowledgeable about their trading condition. I made a huge profit every trading, expeciallyt in my first 6 months of trading I get profit almost 45% from my deposit. The withdraw process was easy without any other requests from the broker and the approval came within 3 to 8 hours. I higly recommend TemplerFx to all trader. I have been trading at Templerfx for about three months now and I am enjoying trading with them. amazing bonus offer. I deposited $200 and got $50 extra as 25% deposit bonus. They allow all types of trading and including scalping EAs. Last month I had an issue with my EA suddenly my EA got freeze for 2 hours and I lost $72 when I contact with their support and give them proper proof they agreed to adjust my loss. They send back my $72 immediately. I really like their honesty. After that I never face such kind of problem. Until now everything is going fine. I opened a Standard account with Templer for arount 5 months ago. My first deposit was 400$ made with the system Skrill, and credited instantly to my account. I trade with them on MetaTrader 4 platform, using the currency pairs EUR/USD, GBP/USD, GBP/EUR, USD/JPY, USD/CHF. My profit is not to much but is good for me as an extra income 500$ a month. Till now I didn't had problems with them. To withdraw was easy and without hidden commissions. I chose to invest my funds here in the amount of USD USD because they have a speedy trading service. Every time I place an order for my favorite Binary Options instruments like AUDCADbo, CADJPYbo, USDNOKbo and GBPUSDbo, I always got a breeze trading executions regardless of the expiry times. The Call and Put Option button work properly. For example, when I placed an order for CADJPYbo last week with an option value of 75 USD and expiry time of 20 minutes, the profit that I earned was about 54.54 USD from that single order. I was literally amazed, because it's really easy to make money here. The chances of winning here are big and apart from it, it's possible to withdraw the profits anytime as long as you follow the rules. templer broker is a reliable broker so far for 2 years trading with them. They provide me good trading condition like other broker provide and the different between with other broker is I’m more comfort trading with them and I already know how the system works. Trading platform work well with me with good speed of execution and their server work well without any server down. Their spread also competitive to me which start from 0.1 pips for major pairs and usually I will trader major pairs because it is easy to compare with other traders because they also trade major pairs. Average profit that I can generate with them 300-500 USD per month and I will withdraw it every month via neteller so that I can secure my money. Overall Templer broker is reliable broker to me and if there any problem, I’m certainly sure they can handle it. 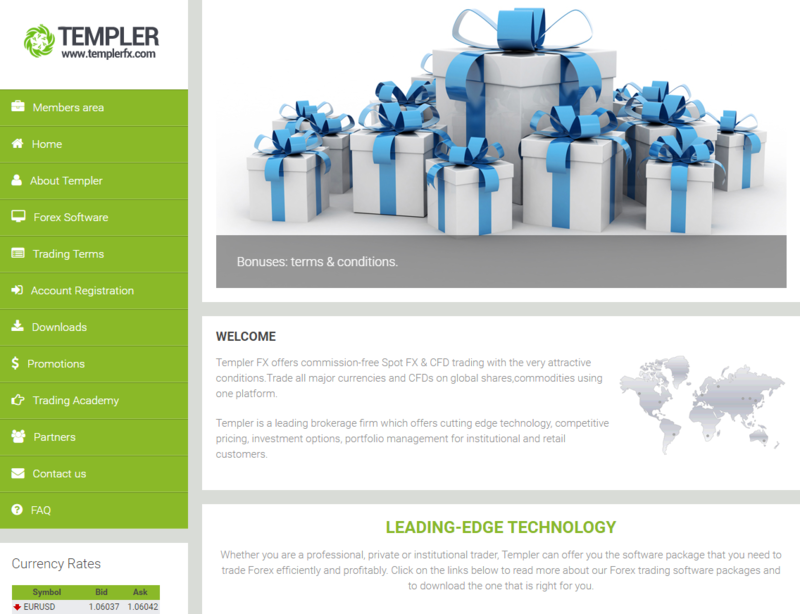 I thought TemplerFx was professional broker but they are not! Their slippage is incredibly bad. Slippage even in the quietest market and prices often freeze around news. Last week I was slipped 52 pips on my stop-loss in EUR/JPY during a liquid part of the day. This lead to an additional $382 loss money they robbed me o on a 3 lot trade because of what they say was a credible fill. I was surprised when I contact with their support they claim there was extreme volatility at the time my stop-loss was filled and that is why it was slipped so much. I already send them the screenshot other broker chart history to compare but they are not listening my words. I would have made money instead of losing half of it. Screw TemplerFx. I would say Templer is a great broker and have been using the service nearly to 1 year. To be real, every time I make a deposit, they also awarded some loyalty bonus about 11% into my trading account. Along my journey using the platform, it was great and well-managed. The most important thing is, less frozen and order execution are mostly executed smoothly. Well, I just received profit withdrawal of $200 credited into bank account and I definitely choose Wire transfer method. Normally, it will take less than 2 days to process and I think it is okay enough. Instead of earning from trading activities, I enjoyed referral and affiliate program as it support and add some income to me. Average I can earned $60 - $80 per week which I found it was a great experience. Thanks Templer Fx! They are a disaster as a broker. Their payment systems don't work properly, you can make deposits but you can't withdraw as this process can take a long time. Just to withdraw $300, I had to wait 3 weeks!!! And I only received the half of that money, I had to send several emails in order to request and claim the another part. The trading platform is very basic and it doesn't allow EAs or strategies as scalping. That's why I switched to another broker more profitable. Every time I make deposits, I received up to 11% loyalty bonus. It's one of the reasons why I still trading with them. This broker never cease by giving away bonuses to all clients. Annually, they offer new bonus campaigns. For example, this year, they offer the No Deposit bonus for the new clients. I refer my friends here and I suggest to avail the No deposit bonus. Luckily, all of them got the said bonus after a thorough verification process. Never heard any complaints from them so far. I bet, they're satisfied using the product and services of this company. Anyway, I would also take the opportunity to share my very pleasant trading experience on Monday, 3rd day of July. When i tried to sell the XAGUSD at a price of 16.19, that was around 15:30PM. My order was honored in less than 0.05 seconds. My earning rapidly increased by 3%. I couldn't believe it because this company usually executes my order after 30 seconds of waiting. This company improves a lot. I would love to recommends my Facebook friends here.